NEW OPEN WATER PROGRAM - Bluewater Scuba - "Where Nashville Learns To Dive"
We at Bluewater Scuba are constantly looking for ways to improve our training programs. Feedback from our students is invaluable and will continue to be so. Starting May 1, 2012, we will be rolling out our new format. We've added MORE POOL TIME, SMALLER CLASS SIZE, A BUOYANCY CLASS, AND LUNCHES! Training with Bluewater Scuba means first class instruction and first class convenience. No other program can offer what we offer. Open Water Class will take place over 3 days (Thursday 6-9:30pm, Saturday 9:30am-5pm, Sunday 1-6pm or 8am-1pm, alternating bi-monthly) with the bonus Buoyancy Class/Practice Time on Tuesday nights (6-10pm). Our Open Water students receive unlimited practice time and are able to sign up for as many Tuesday night practice sessions as they'd like prior to their open water certification dives. Our intent is to have the most comfortable and prepared divers in the water, no matter how many pool sessions it takes. Having the only onsite training pool in Nashville makes that possible and extremely convenient. Speaking of convenience, we've also decided to provide lunch for the Saturday classroom session and for both days of the certification dives. This will save valuable time and the hassle of coordinating a group order. Our students don't have to worry about it. Lunch will be ready when they hop out of the pool on Saturday, and out at the quarry. Diving isn't just about skills; it's also about the fun you have underwater and topside with the friends you make. Training with Bluewater Scuba provides the full dive experience with quality training. That quality training now also includes a Buoyancy Class. Buoyancy is by far the most important skill in diving. It keeps divers from crashing into the underwater environment or descending past their depth limits, and keeps them from rocketing toward the surface in rapid ascents. Safe divers have good buoyancy. The open water class introduces buoyancy skills, but it's something divers will continue to refine the more they dive. We have decided to add the buoyancy class to the open water training so students can carry that momentum into more advanced buoyancy training. The training dives can be rolled into the open water certification dive weekend and students will now graduate with a specialty certification in addition to their open water certification. If the students would like a cert card, they can purchase the card for only $36. 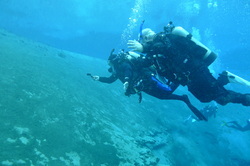 The training is included with open water class. The buoyancy classroom session will take place on Tuesday nights from 6-7pm, and then pool training will be from 7-10pm. All of our students are eligible for discounted equipment packages with mask, snorkel, fins, boots, bag, defog, and wetsuits. These packages also include a free 2hr pool rental for practice after certification and a free tank rental to go out and dive locally. Students who purchase their own BC, regulators, and/or computers/gauges will also receive a discount of $100-$200 off their open water training. The benefits of learning to dive in the actual equipment you'll be diving on your dive trips is huge. Safety and comfort drastically increase when your equipment is custom fit. Our open water students are provided rental BCs, regulator, and gauges during their training, but those that purchase their own are eligible for the training discounts. The bottom line is we want to provide the best training you can find, and we believe this new format will better enable us to do that. Stop by the shop sometime, get a tour, and find out for yourself why Bluewater Scuba is "Where Nashville Learns To Dive."